On 19th January 2016, specialist flute students took part in a masterclass with renowned flautist, composer and educator Mike Mower. 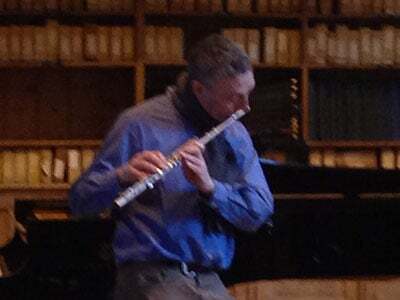 Mike originally studied classical flute at the Royal Academy of Music, London. He also plays the saxophone and clarinet and has led numerous Jazz ensembles, playing his own compositions, from quartet to big band. In 1985 Mike founded and led Itchy Fingers, the internationally renowned jazz saxophone quartet which toured the world until disbanding in 1997. As a freelance musician, Mike has played and recorded with jazz, rock and classical artists as diverse as Gil Evans, Tina Turner, Paul Weller, Björk, James Galway and Ryuchi Sakamoto. Mike offered some excellent coaching to our flute students as well as giving an improvisation class and an insight in to the commercial side of flute playing.